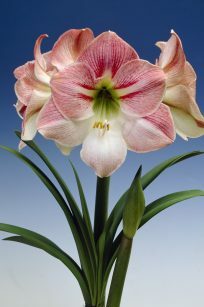 Growing Instructions: Amaryllis: Select a pot that is approximately ½” in diameter larger than the bulb. Fill the pot approximately half full with a good quality, sterilized potting soil that drains well. Place the bulb into the pot and continue adding soil, leaving the top 1/3 of the bulb exposed. Be sure there is at least ½” of space between the soil and the top rim of the pot for watering. Water thoroughly with lukewarm water immediately after potting. 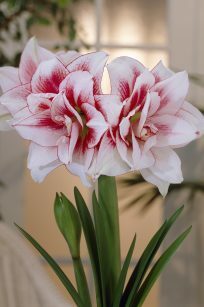 Keep the soil moist but not wet, and avoid getting water directly onto the bulb stem. Place the pot in a warm room that is well-lit; a south-facing window is best. Do not overwater once the shoots begin to appear. When flowers begin to bloom, move the pot to a slightly cooler spot where it receives indirect lighting. 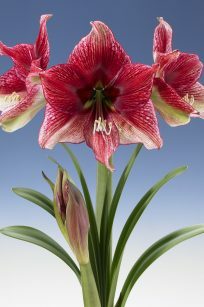 After the flowers fade, cut the stem off leaving approximately 3″ above the top of the bulb. Do not remove or cut off the leaves. Treat the plant as you would any indoor plant, watering it lightly and regularly to keep the soil moist. 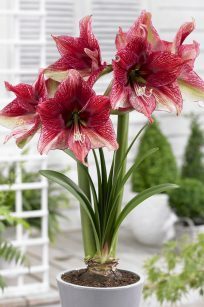 If you wish to rebloom the Amaryllis in the fall, stop watering in August and place the bulb, still in the pot, in a cool, dry place for 10-12 weeks. In mid-November, remove the bulb from the old pot; remove dead foliage and old roots, but leave clean, healthy roots intact. Repot in fresh soil as indicated above in a pot only slightly larger than the bulb. 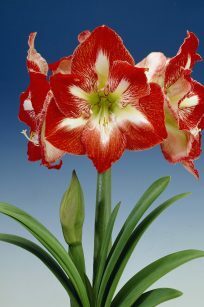 If properly cared for, the bulb should bloom in 8-10 weeks. 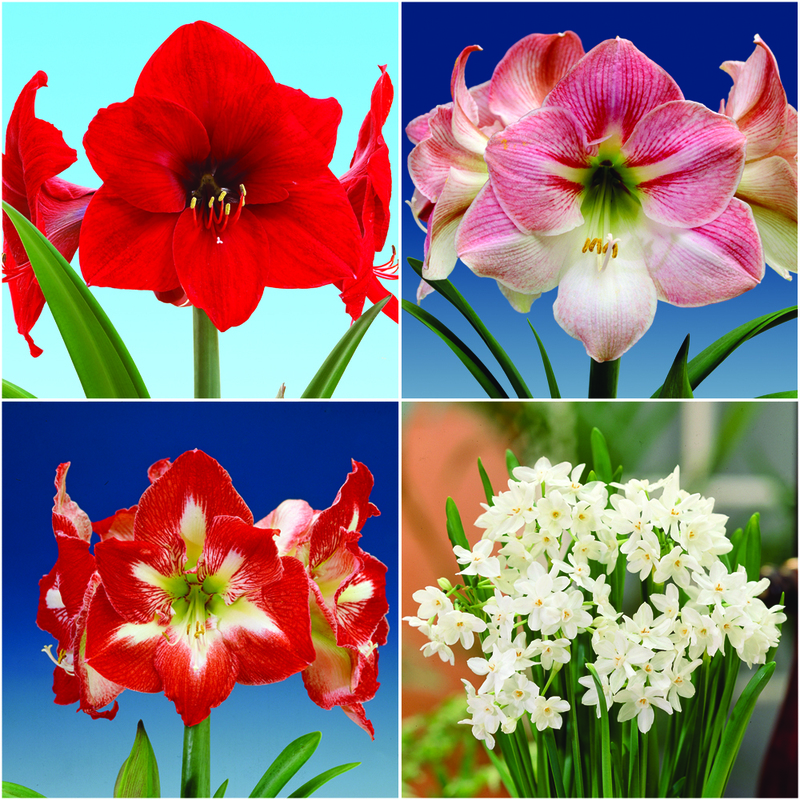 Paperwhites can be grown without soil. Just place some gravel, stones, or decorative glass in a container of your choice that does not have drainage holes. Cluster the bulbs together, nestling them in with their pointy ends up. Place additional planting medium around them to anchor them in place. 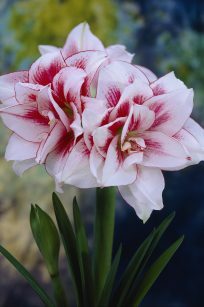 Add water just to reach the lower portion of the bulbs, and maintain it at that level throughout the time the bulbs are growing and blooming. Place the container in a cool (50?-60? F) place away from direct sunlight. 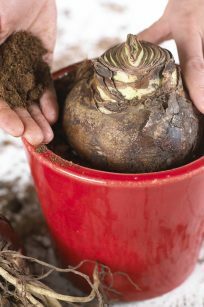 Once per week, gently tug at the bulbs to check for root growth. When shoots appear, place the container in direct sunlight. Soon after planting, green leaves will burst forth, and clusters of pure white, star-shaped flowers will bloom on each stem. Turn the container frequently to maintain straight leaves and stems. The clusters of flowers at the top of each stem sometimes tend to lean over as they grow. You may wish to stake the plants when they reach a height of 10-12″ to prevent them from toppling over as they grow to their full height. 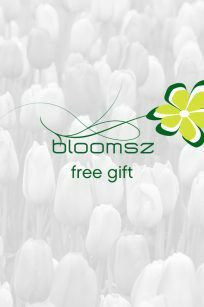 Note: Once Paperwhites ‘Ziva’ have been planted and have bloomed indoors, they will not rebloom outdoors. Simply remove them from their container and add them to a compost pile or throw them away.